Global warming is a simple enough concept. But it doesn’t explain all the changes the Inuit have noticed. 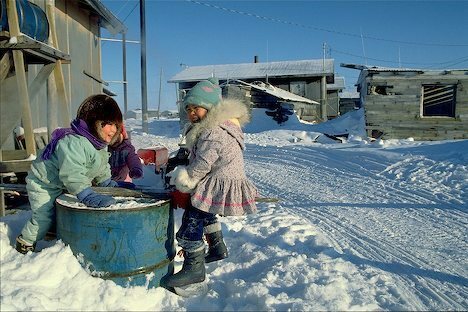 The Inuit, a group of indigenous people inhabiting a huge band of territory in northern Alaska and Canada and coastal Greenland, are confused by spring these days. The top layer of snow no longer freezes hard at night in June, which makes nighttime sled runs more difficult. Sea ice breaks up earlier in spring, and freezes later in the fall. The animals seem confused too, “turning up in unexpected places or at unexpected times of the year,” wrote Shari Gearheard, a Nunavut-based climate researcher, in a 2008 issue of Natural History Magazine. Gearheard, a full-time arctic resident and research scientist with the Cooperative Institute for Research in Environmental Sciences (CIRES) at the University of Colorado at Boulder, teamed up with her Boulder, Colorado-based colleague, CIRES senior research scientist Elizabeth Weatherhead. Together, they’ve put science to the Inuits’ observations, documenting for the first time a subtler effect than global warming. The researchers have become interested in the persistence, or consistency, of weather. A thing like unpredictability in weather patterns can be overlooked by non-human weather stations and computer data sets. “The Inuit were focusing on something that I think now is extremely important that we scientists hadn’t given much attention at all,” Weatherhead said. The scientists set out to explore whether weather is getting more chaotic and less predictable around the world. They found compelling evidence for that phenomenon in Inuit territory–and in an opposite way, around the world. Gearheard, Weatherhead and their third co-author, Roger Barry, also of CIRES in Boulder, published their new results online last month, in the journal Global Environmental Change. 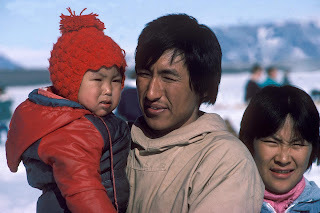 The Inuit have long been keen observers of the weather, raising their children to go outside in the mornings and return with accurate reports of wind speed and direction, cloud formations and animal behavior, among other sophisticated factors. 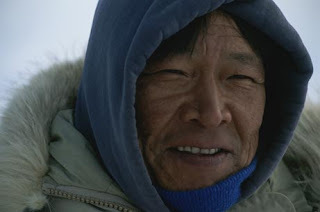 The Inuit hunters and elders raised an issue that had not been fully addressed in the scientific literature, they wrote–the increased variability and unpredictability of weather. Gearheard, a dog team driver herself who lives in the northern Canadian province of Nunavut, was experiencing first-hand the fear that comes with riding on a sled behind dogs whose feet poke through once-solid ice. The researchers examined 50 years of hourly temperature records from two locations: Baker Lake, an inland site northwest of the Hudson Bay and Clyde River, Gearheard’s home, on Baffin Island’s northeast shore. The Baker Lake data revealed significant changes in the persistence of spring temperatures in the past 15 years. The Clyde River did not reveal such changes, but the researchers say that’s possibly because Baker Lake is more inland, and therefore less influenced by unrelated changes in the Arctic Ocean. “The Baker Lake observations show a systematic change that matches with the Inuit observations,” Weatherhead said . But they are also “somewhat at odds with changes in persistence on a more global scale,” the authors write–those show a slight but significant increase in persistence. Weatherhead said the new results point to two important points about climate research: the importance of indigenous knowledge, and of climate changes more subtle than global temperature. “The idea that the world is warming doesn’t interest me as much as some of the other changes that are taking place,” she said. Weatherhead would like to study persistence on a more global scale. “If I had some benefactor willing to let me study whatever I wanted, I would want to take the lessons here and ask other Natives, or people who live off the land, what changes they’re seeing,” she said. And science has something to give back to those people, she added. This entry was posted in First Nations. Bookmark the permalink.